Silver coin fragment. 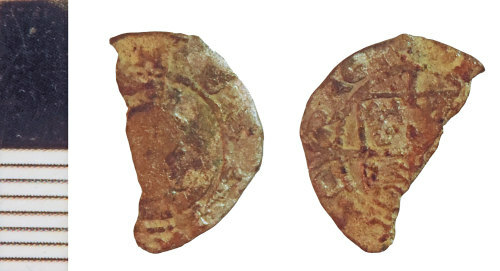 Possibly part of a penny of Elizabeth I (1558-1603), possibly third coinage of 1561-1577 (cf. Spink 2004 no. 2570). A little under half the flan is lost. Reverse description: Shield of Arms of England and France, long cross, no date. Silver penny of Elizabeth I (1558-1603), Third Issue (1561-1577), mintmark castle (1569-1571), Spink 2570.